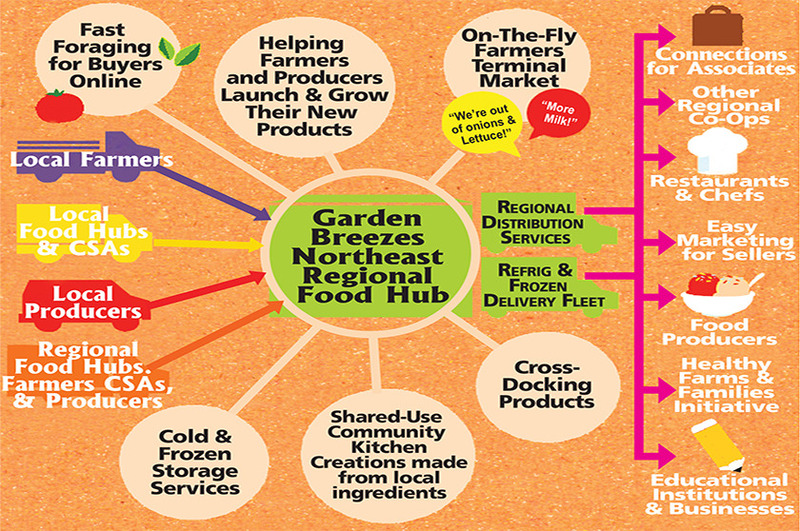 Garden Breezes Northeast Regional Food Hub (GB~NR~FH), is a collection of local farmers, wholesale producers, professional food buyers, distributors, industry suppliers and consumers in a sustainable and robust “Craig’s List” style brick & mortar 24/7~365 Open Farmers MarketPlace and dynamic online marketplace with interactive directory. Is a self-reliant system which will allow as much local and regional foods as possible to be produced, processed, distributed, and purchased. Self-reliance will be reached by supplying as much “source-identified” foods in a region that is physically possible without degrading the resource base. The result is maximum resilience, minimum importation, and significant economic and social return in the region. The term “source-identified” is crucial: this isn’t about stockpiling anonymous goods from any old place. It facilitates direct farm-to-fork connections with complete transparency, promoting the brands of growers and makers alongside the products. Diversity will provide strength to GB~NR~FH because it will preserve options which allow for flexibility and resiliency. In a larger region a wider variety of foods can be produced and processed. Many regions have a diverse population base that seeks access to sufficient and culturally appropriate foods. GBFH Northeastern regional food system includes multiple “locals” within each state included in the region and those that cross state boundaries. The 12-State Network definition comes from the USDA, but it is not a strict boundary. The 12 Northeastern states include Connecticut, Delaware, Massachusetts, Maine, Maryland, New Hampshire, New Jersey, New York, Pennsylvania, Rhode Island, Vermont, and West Virginia.